I hesitate to call this a meatloaf. I didn’t like meatloaf much back in my meat-eating days, and I love this savory mix of lentils and vegetables. For many people, however, meatloaf was a comfort food and they are looking for a vegan substitute. 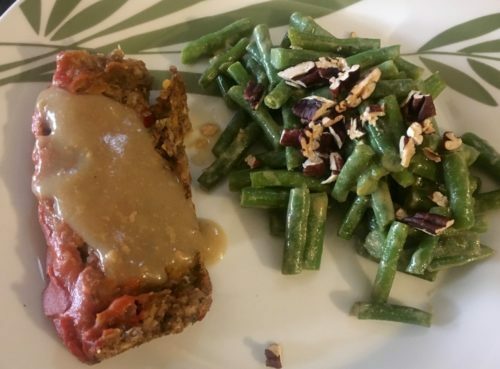 So here’s my version of a Savory Vegan Lentil Meatloaf. I used to make my vegan meatloaf from mushrooms. A surprising number of people, however, don’t like mushrooms in any form, and the texture was never quite right. I’ve made others that require breadcrumbs, but the texture of those wasn’t right either. I went with lentils because I love their earthiness, and they’re readily available in Guatemala. I use brown lentils, but you can try other types. The flax seed mixed with water helps bind the loaf, taking a job left to eggs in non-vegan recipes. This is one of those recipes that even my meat-loving dad loves. My starting point for this recipe was the Ambitious Kitchen blog. It’s pretty easy to make from ingredients I keep on hand, and can be gluten free. Since I’m a sriracha freak, I had to amp up the glaze with a healthy dose of my favorite hot sauce–leave it out if you don’t want the spiciness. Thoroughly rinse the lentils. Place the lentils and 2 cups of water in a large pot and bring to a boil. Reduce heat to low and simmer for 35-40 minutes or until lentils absorb most of the water. Remove from heat and set aside. While the lentils are cooking, mix ground flax seed and 1/3 cup water in a small bowl and set aside. Prepare the glaze by mixing the tomato sauce, mustard, cider vinegar, soy sauce, and sriracha in a measuring cup. Preheat oven to 350 degrees F. Prepare a 9 inch loaf pan by greasing it with a few drops of vegetable oil. In a nonstick pan, dry sauté onion, bell pepper, carrots and jalapeño until onions are translucent and carrots soften a bit. Transfer to a large bowl, stir in spices and basil, and set aside. Using a blender or food processor, blend 1/2 of lentils. Transfer to the bowl with the sauteed veggies, and stir in the remaining lentils along with the oat flour, and the flax seed and water mixture. Add salt and pepper, then adjust the seasonings to taste. Spoon the mixture into the prepared loaf pan, pressing it evenly into the pan to fill any spaces. Smooth the top of the loaf, then spread the glaze over the top. Bake loaf for 45 minutes. Remove from oven and cool for 5-10 minutes before slicing. This loaf is delicious with a simple gravy. It also makes excellent leftovers and sandwiches.